This is a simple but impressive dish that is sure to satisfy those you choose to entertain. Pro tip: add sea salt and pepper to each layer of this dish as opposed to just one. This way, you will have an evenly seasoned recipe and can avoid using your saltshaker at the table. 8 spears thin asparagus, washed and well-dried. Preheat oven to 400 degrees. Place grill pan in oven. Spread 1 c. mixed greens on each of the two plates. Tear one basil leaf and throw in with the each plate of greens. Arrange the tomatoes around the greens. Add one thick slice of mozarella atop the greens. Top with 2-3 slices of avocado and one basil leaf. Add the second slice of mozarella to each plate. Top each with the remaining basil leaf. Brush asparagus with 1 tbsp olive oil and a dash of salt and pepper. Place on hot grill pan and bake for 5 minutes. Top salad plates with asparagus spears. Finish off by drizzling 1 tbsp. 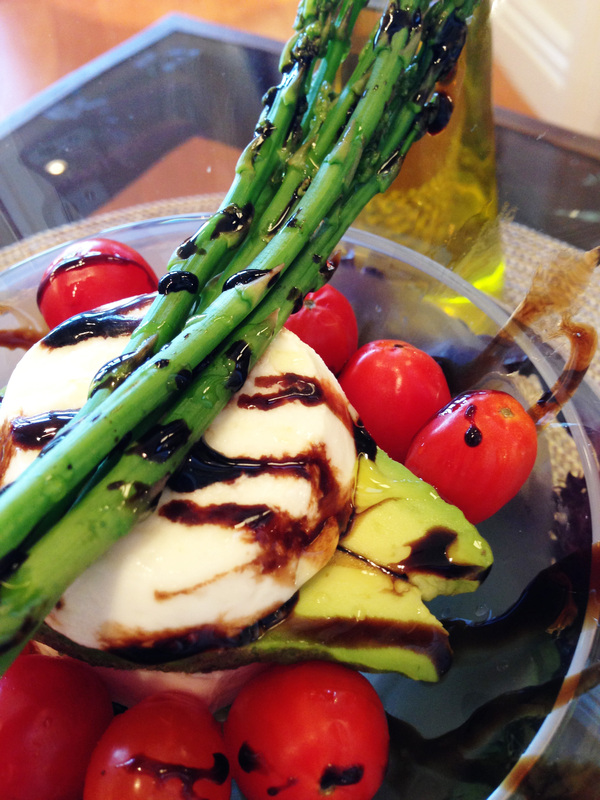 of thick balsamic vinaigrette, followed by 1 tbsp. of olive oil.